New Project in NYC: 45 Broad Street! 45 Broad Street is located at 45 Broad Street, Manhattan New York. Co-development investment by Pizzarotti Group, Madison Equities & Gemdale, Cetra Ruddy Architecture, DPC surgeon design, and BuroHappold Engineering as curtain wall consultant. Strategically located in lower Manhattan’s Financial District, 45 Broad Street is adjacent to Broadway, Wall Street, directly across the street from the New York Stock Exchange and the Parliament Memorial, and Freedom Tower. The main structure of the project has a total of 83 storeys, with a total building height of 1131 feet (345 meters) and a curtain wall area of approximately 29,830 square meters. The building is comprised with 8-storey boutique office building and provides office space for Manhattan’s technology innovation and media companies. 206 luxury residential apartments are designed to enhance the home-based experience of high-class white-collar and successful people with high-quality smart living facilities and 3-storey underground service facilities. Such is that of typical commercial and residential buildings in one. The façade of the building is mainly composed of glass curtain wall. The south façade is made of aluminum curtain wall. The building is surrounded by vertical aluminum decorative panel and the double curved aluminum plate is used in the western podium on the 33rd and 53rd floors to form the tree branches and cross shapes. The overall design not only meets the architectural performance requirements, but also fully reflects the high-end buildings, sophisticated, changing characteristics. 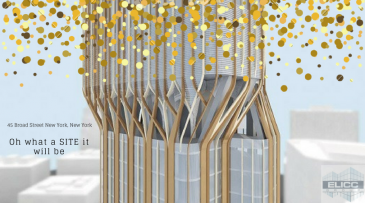 Due to its non-replicable geographic location and distinctive architectural plans, the project will be the new landmark on Wall Street to mark the NYSE when completed. Since receiving the sensitive information, our company immediately mobilized and organized a strong bidding team, conscientiously studied the bidding documents, understood the bidding intent, formulated a careful work plan and meticulously organized the implementation. The bidding time sawing up to six months, heavy workload, departmental personnel difficulties, solidarity, high efficiency, high quality preparation of tender documents and design drawings, and delivered on schedule. In the end, the Pizzarotti Group won the award and successfully won the bid with its good reputation, outstanding industry experience, strong technical strength, perfect quality/schedule control system and reasonable quotation. 45 Broad Street Project Developer Pizzarotti Group, a century-old top construction company with operations all over the world, marks a milestone in the bidding process and demonstrates that while Arrow continues to solidify the high-end curtain wall market in the United States, A huge breakthrough, even in the face of unprecedented competition in the industry, we are still tearing forward! Contact us and see all our projects here!